Weather: We will plan on a beautiful, sunny day – but this is P-Town and we are unafraid of RAIN, so bring it!! Water: We will have a water stop or two depending on the amount released from the sky that day. And for a 5K in early May, it could be rain, shine, or maybe even snow flurries. Oh the joys of being a PNW Runner! But no matter the weather, the Hosford Husky Hustle will go on. This run/walk fundraiser is to engage the community and raise money for Hosford Middle School. 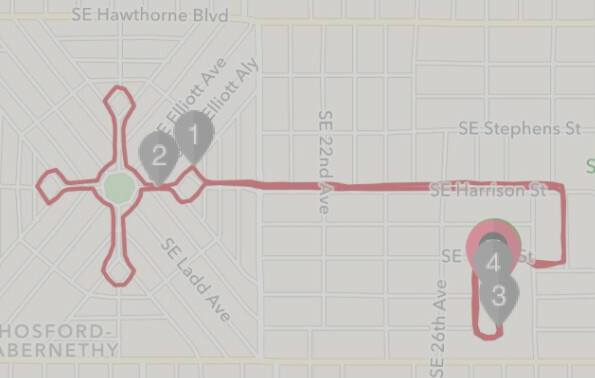 The course curls and curves through Ladd’s Addition in SE Portland, using sidewalks to be in the same neighborhoods as the kids these runners and walkers are supporting. The event begins Sunday morning at 10am with the after party kicking off at 11 with snacks, photos with the Hosford Husky, and raffle drawings. Every participant gets a raffle ticket with registration and can purchase more online or on race day. To make sure that students can be involved, there are scholarships available. Check out the website, check out the course, and check out how you can be involved in helping these kids hustle. Cost: $25 for adults, $15 for kids (18 & under), and $75 for a family of four. Prices increase April 1. Writer of stories. Organizer of lives. Advisor of academic journeys.